The manta ray (Manta) belongs to the family of devilrays and reaches a wingspan of up to seven meters at a weight of around two tons. The most characteristic feature are the two additional headfins, which helps them to bring plankton-rich water to the mouth. 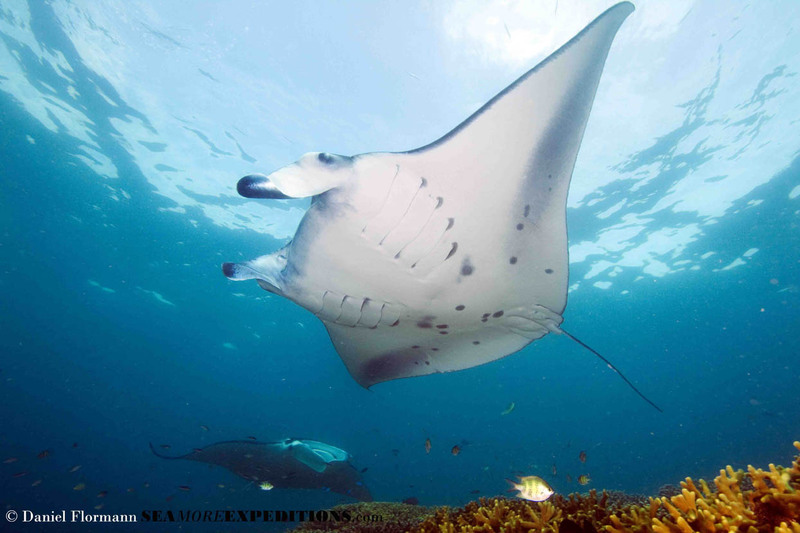 In contrast to most other rays mantas do not have a poison sting. They reach maximum velocities of 10km/h, while preferring tropical and subtropical waters. After a gestation time of around one year the subadults are born at a size of two meters in wingspan at a weigth of ca. 10kg. The main natural enemy is the tiger shark. Manta rays are not dangerous for humans.